Posted on September 28, 2016 at 10:15 am. 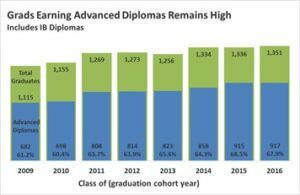 Sept. 28, 2016 — In 2016, the number of APS students who graduated continued to rise (1,351) with 68% earning an Advanced Studies or IB diploma and 93% of those responding to a survey reporting that they plan to attend college. While this year’s On-Time Graduation Rate (OGR) remained high at 91.1%, it was 1.7 percentage points lower than 2015. The OGR reflects the percentage of students who earned a Board of Education-approved diploma within four years of entering high school for the first time. Prior to this year, OGR increased by more than six percentage points from 85% in 2009. 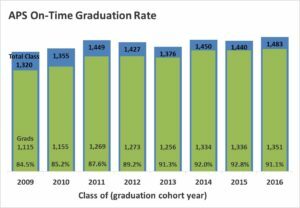 For those APS students who started as freshman in the fall of 2012 at Wakefield, Washington-Lee, or Yorktown and remained in APS throughout high school, the graduation rate was 97%. Eighty-one students dropped out, an increase of 1.3%. The good news is that over the past five years, the dropout rate has declined for Black students by 5 percentage points and for economically disadvantaged students by more than 9 percentage points. The Virginia Department of Education (VDOE) released 2016 On-Time Graduation and Dropout Rates this afternoon. On-time graduates are those who earned a Virginia Board of Education-approved diploma . Dropouts reflect the students who dropped out or whose status is undetermined. Advanced Studies Diplomas include International Baccalaureate Diplomas earned by students in the IB program at Washington-Lee High School. Modified Standard Diplomas and Special Diplomas are available only to students with disabilities and, beginning with the Grade 9 class in 2013-14, will no longer be offered.